Gluten Free - What can I eat? Daily menu plans. 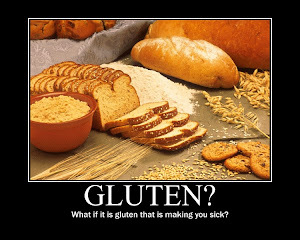 : Odd benefits of not eating gluten. I'm just a little over 4 years gluten free. First, and most importantly, my chronic fatigue, constant body aches and headaches have went away. My fibromyalgia has basically disappeared. But also, there have been some subtle changes and some of them are just happening recently, 4 years in. I have had to turn down the volume on all the things I listen to, TV, my computer, my car radio and my husband's computer - all of them, because my hearing is better. My skin has cleared up. I thought that acne was going to follow me into my 50s and this might be an aging thing, but my skin has cleared up. The last thing is that my hair is thicker. I used to be able to put all of my hair in a ponytail and it was only maybe 3/4 of an inch in diameter and now it is nearly twice that. I feel like I have so much hair now! Have you noticed any odd benefits? Also, my eyelashes are thicker and longer. I just decided to pop over and see what was new on your blog and was delighted to read your post, dear! Woohoo on continued improvements even over this period of time!! I know that I remember 2 years as being a big turning point and when I get glutened I sure see what issues have gone away, because they return fairly quickly. Will share your post and some highlights on my gfe Facebook page. I'm sure that others will have similar results to report and your results will help those who will never get a positive diagnosis for celiac (or even be allowed to get a test done in some cases) be willing to try gluten free. Thanks, dear! So happy for you!